Salmon is the second most popular fish in America, after canned tuna. And why not? It is both nutrient-rich and delicious. Paired here with our low-FODMAP spinach and basil pesto (no garlic and just the right amount of cheese included), your dinner guests will enjoy a colorful and fragrant festival for the senses. Serve on top of balsamic vinegar-drizzled brown or white rice. Leftovers can be gently re-warmed or enjoyed cold, in a salad with chopped cucumber and diced tomato. Measure the olive oil, water, salt, pine nuts, and parmesan into the bowl of a blender or food processor. Add the spinach and basil leaves while the machine is running and process the pesto until a coarse paste is formed. Position the top rack of the oven about 6 inches below the broiler and preheat it with the oven door ajar. Line a baking sheet or broiling pan with foil for easy clean up. Cut the fish into 6 pieces and place fillets flesh side up on the prepared baking tray. Broil for 6 minutes, then flip the salmon over and broil until the skin is visibly blistered, about 2 minutes. Remove the pan from the oven and use a fork to gently lift the skin off the salmon. Check to make sure the salmon is almost done; pull the flakes apart gently on one of the fillets using two forks. If it is not yet opaque at least 75 percent through, continue to broil for another minute or two. 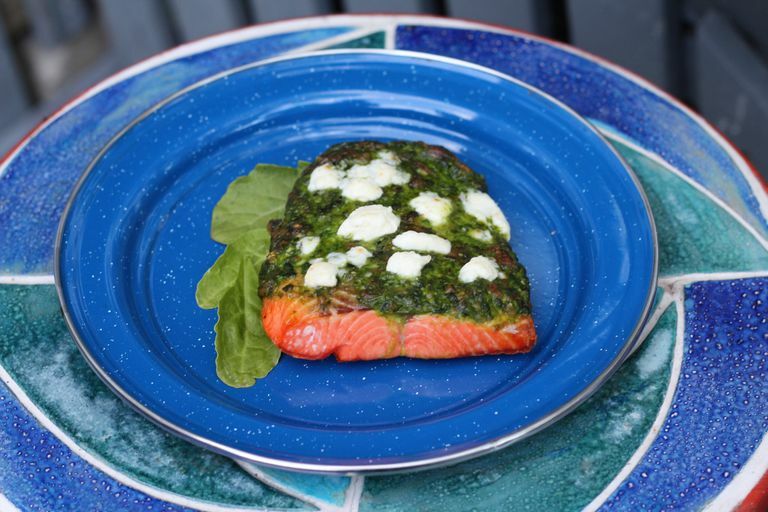 If it is almost done, spread the pesto evenly on top of the salmon fillets, then sprinkle with feta cheese. Return to the broiler for 2 to 3 minutes, until pesto is bubbling and feta is softened. Serve promptly. Any ratio of spinach to basil can be used in this recipe, so use according to your flavor preference! Cooking time for salmon can vary significantly depending on the variety of salmon and the thickness of the fillets. Adjust accordingly. To save time, purchase pre-grated Parmesan cheese. Be sure to use full-fat feta made of cow's or sheep's milk. Reduced-fat cheese will not become soft under the broiler. Refrigerate any leftover pesto, tightly covered, to use later on top of your favorite gluten-free pasta or as a sandwich spread.